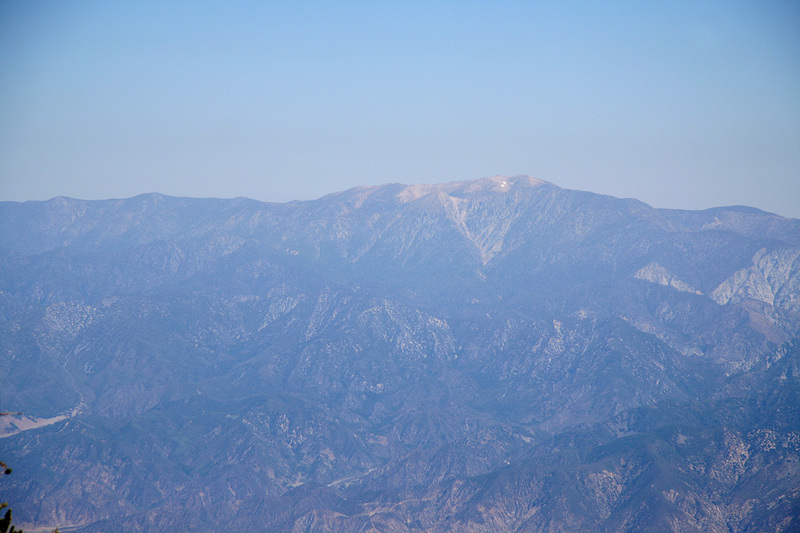 How to get there: This mountain is located near Los Angeles. 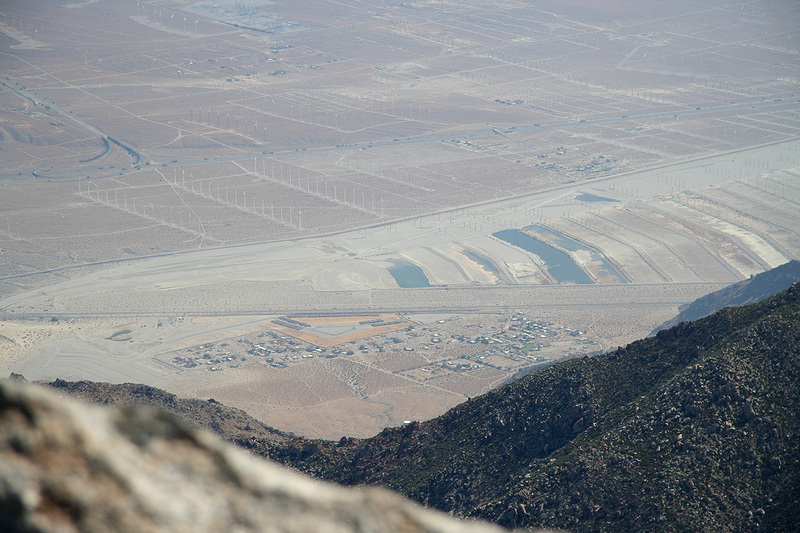 More precisely, it is located south of San Gorgonio and just west of Palm Springs. There are several trails and points of access, this description avoids the cablecar and leads to a relatively short route to the summit. 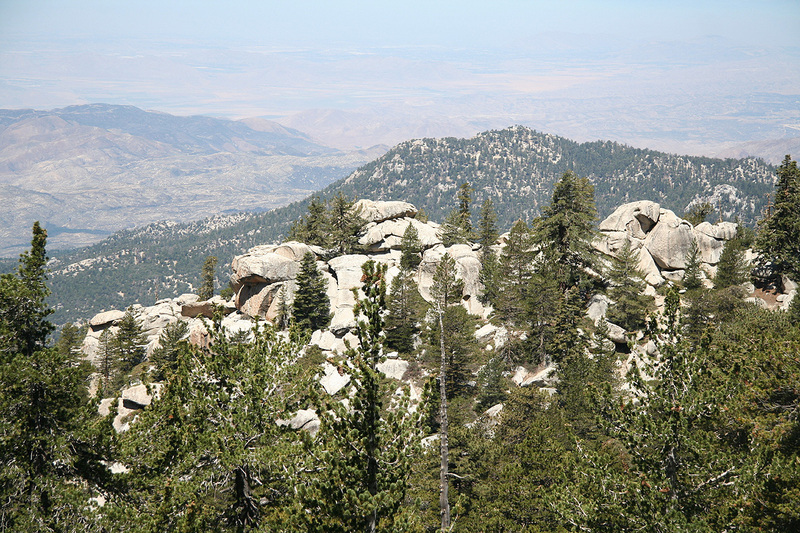 Locate the charming village of Idyllwild, located on Hwy. 243 that connects Hwy. 74 (south) with Hwy. 10 (north). Start to measure in the center of Idyllwild. Go north on Hwy. 243, 5.4 miles. At this point turn right, there is a road sign saying Azalea Trails. At 5.5 miles you approach a campground, there are signs saying "Use fees collected", do not enter but turn left before this sign. Continue on a winding, paved road. At mile 6.3, continue straight ahead, then at mile 6.6, take the right fork (the left serves another campground). Proceed to mile 6.8 where there is parking between trees on your left side. Note that parking here also requires that you have the Adventure Pass (dollar 5) that is sold by the Forest Service. 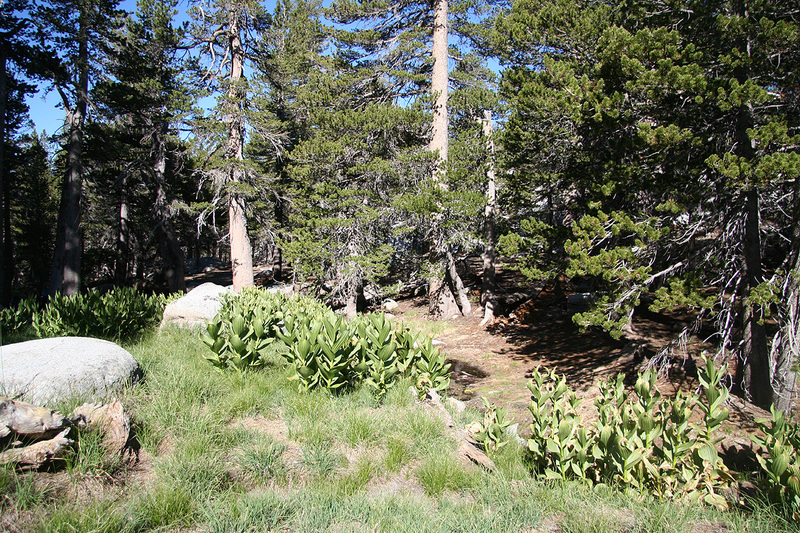 This is the trailhead, location N33:47.471, W116:44.150, elevation about 1930 meter. Route description: From the trailhead, first follow a zig-zag trail that climbs the first hillside and traverses just abobe the Marion Mountain Campground. Continue to follow the trail called Marion Mountain Trail for 2.5 more miles where it intersects with other trails. 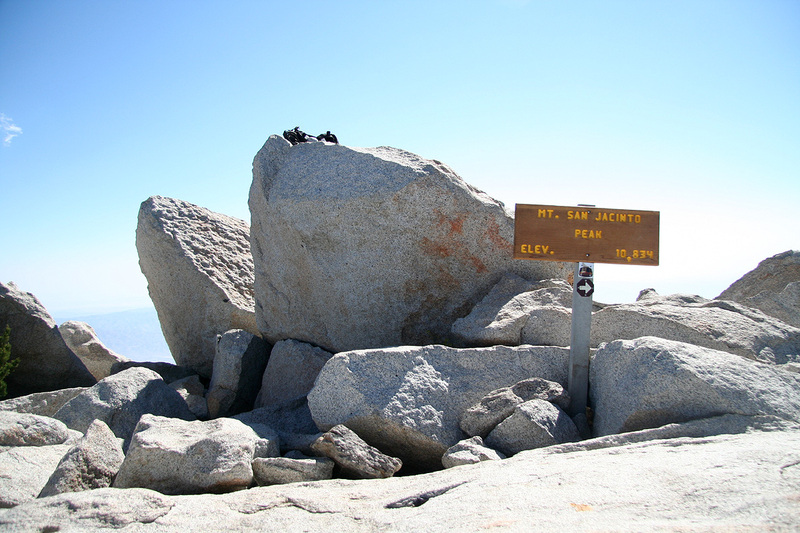 Signs will always point you towards San Jacinto Peak. Another 1.5 miles and you arrive in a flat area (with a couple of creeks) called Little Round Valley. This is a popular place to camp for backpackers. Another mile, then a short summit trail going left to the summit. 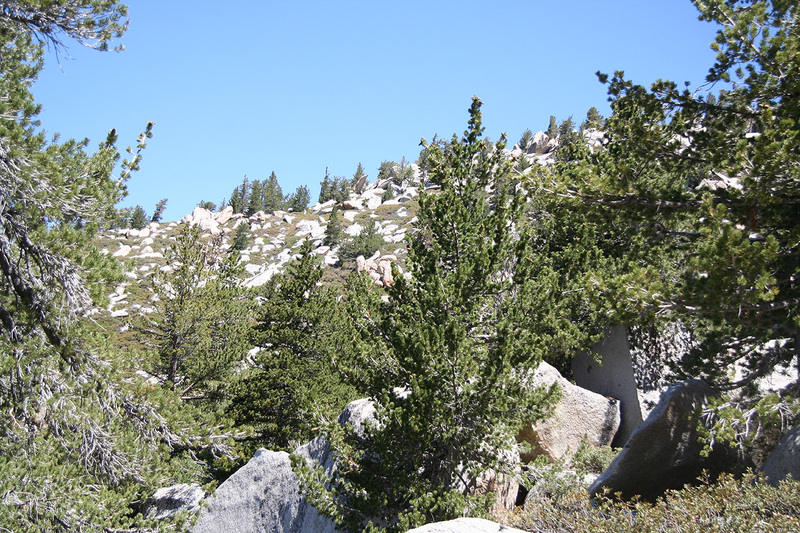 The trails are very good, most of the hike is among pretty large trees, however, the landscape is pretty characterized by big boulders that seemingly have been spread around almost everywhere. The summit area is no exception, the highest point is indeed on top of a pretty good sized boulder. Comments: I arrived after dark, having enjoyed a very good dinner in Wrightwood. I left my car at 0600 and followed the completely obvious trail to the summit, arriving there at 0930. It was a very nice day and my last summit in this (part-I) period of my summer trip. I spent a full hour before beginning the return hike at 1030. About 15 minutes after arrival, another (middle age) man arrived. He told me he needed the activity as he prepared for going to Elbrus and Kilimanjaro, part of his chasing the seven summits. When I asked him if he had climbed Everest, the answer was afirmative, "three times to Everest and two successful ascents." When I asked why he climbed it twice, the reply was that he needed to check out both the south route as well as the north route. It turned out that the guy had climbed several more 8000 meter peaks in the Himalayas, just the kind of "random" guy that I tend to run into. Back at the car by 1245 and ready to go to the SIAM annual meeting in San Diego. However, first a very good lunch in Idyllwild, a perfect way to end what had been a very varied and fine week in the mountains. 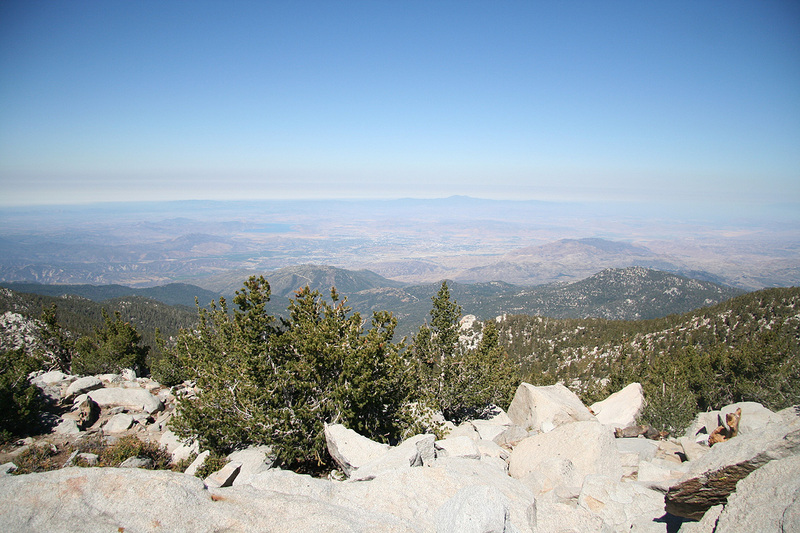 San Gorgonio, as seen from San Jacinto.